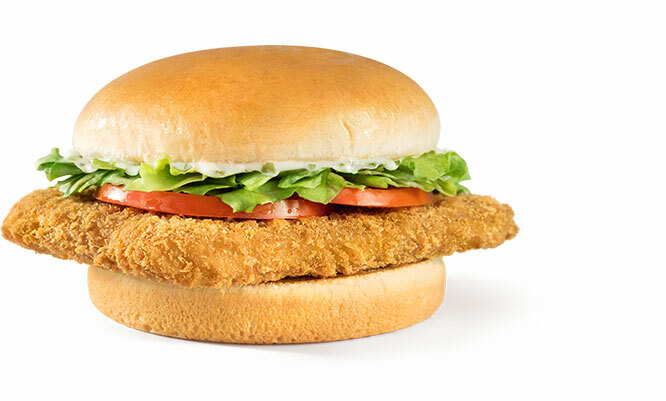 Panko-breaded white fish filet with lettuce, tomato and tartar sauce on a small white bun. A delicious option for only 520 calories. Add apples and a diet drink for just 30 more calories. Ingredients: Small White Bun: Unbleached enriched flour (wheat flour, malted barley flour, niacin, reduced iron, thiamin mononitrate, riboflavin, folic acid), water, high fructose corn syrup, soybean oil, contains 2% or less of each of the following: yeast, wheat gluten, salt, dough conditioners (contains one or more of the following: sodium stearoyl lactylate, calcium stearoyl lactylate, monoglycerides, mono- and diglycerides, distilled monoglycerides, calcium peroxide, calcium iodate, datem, ethoxylated mono- and diglycerides, enzymes, ascorbic acid), calcium sulfate, calcium carbonate, ammonium sulfate, sorbic acid, soy flour, monocalcium phosphate, soy lecithin, and calcium propionate (to retard spoilage). May also contain grain vinegar, cornstarch, citric acid, and potassium iodate, and calcium phosphate. Contains: Wheat, Soy. Bun Oil for Small White Bun: Liquid and hydrogenated soybean oil, soy lecithin, natural & artificial flavor, beta-carotene (color), TBHQ and citric acid added to protect flavor, dimethylpolysiloxane, an anti-foaming agent added. Tartar Sauce: Soybean oil, dill relish (cured cucumber, water, distilled vinegar, salt, xanthan gum, sodium benzoate and potassium sorbate [as preservatives], calcium chloride, natural flavors, polysorbate 80), distilled vinegar, egg yolks, contains less than 2% of sugar, salt, onion, mustard bran, sodium benzoate and potassium sorbate (as preservatives), garlic, spice, natural flavor, calcium disodium EDTA added to protect flavor. Iceberg Lettuce: U.S. No. 1 crisphead (Iceberg) lettuce. Tomato: U.S. No. 1 tomatoes coated with vegetable-, petroleum-, beeswax-, and/or shellack-based wax or resin. Whatacatch® Fish Filet: Alaska Pollock, water, food starch-modified, yellow corn meal, bleached wheat flour, yellow corn flour, rice flour, contains 2% or less of the following: salt, enriched wheat flour (flour, niacin, reduced iron, thiamine mononitrate, riboflavin, folic acid), spices, leavening (sodium bicarbonate, sodium aluminum phosphate, ammonium bicarbonate), sugar, soybean oil, palm oil, yeast, citric acid, garlic powder, onion powder, corn syrup solids, sodium citrate, dextrose, extractives of turmeric and paprika (color), celery seed, concentrated lemon juice, natural flavor. 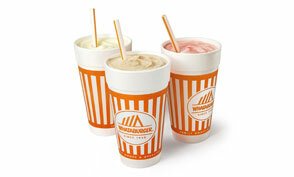 (Note: Deep-fried in Whataburger ZTF liquid shortening. Menu items that are deep-fried may come in contact with other products that contain gluten, wheat, dairy, egg, soybean, fish, or animal products.) French Fries: Potatoes, soybean oil, dextrose, disodium dihydrogen pyrophosphate (to maintain natural color). (Note: Deep-fried in ZTF Whataburger liquid shortening and seasoned with Whataburger fry salt. Menu items that are deep-fried may come in contact with other products that contain gluten, wheat, dairy, egg, soybean, fish, or animal products.) Fry Salt: Salt flour consisting of natural crystalline. Coca-Cola® Classic: High fructose corn syrup, water, caramel color, phosphoric acid, natural flavors, and caffeine.